In 2014, a year after Trudeau assumed the leadership of the Liberal Party, he was already leading 18-to-29-year-olds by a larger margin than any other age group. Polls in the immediate aftermath of last October’s Liberal landslide showed that young voters supported Trudeau at higher proportions than other age groups. 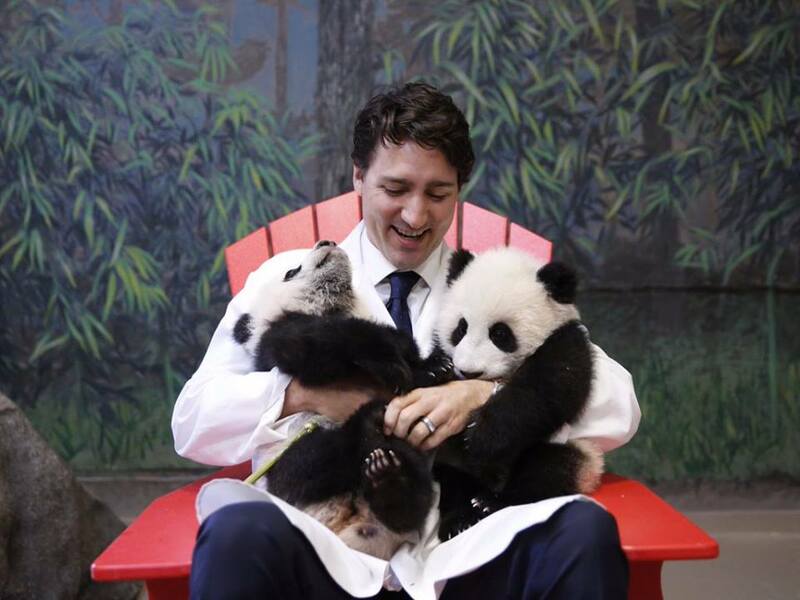 For a generation marked and mocked by its quest for ‘authenticity’ (just look to the margins that Vermont senator Bernie Sanders has racked up against former US secretary of state Hillary Clinton), Trudeau has the je-ne-sais-quoi ability to connect, even when he’s preening for the cameras with two panda cubs in hand. Millennials are more diverse than prior generations, in Canada as well as the United States. It was their generation, in particular, that cheered when Trudeau responded to a question about gender parity in his new cabinet with a shrug and a kurt, ‘Because it’s 2015.’ They loved when he personally welcomed Syrian refugees to Canada in December at Toronto’s airport. It’s reminiscent of Barack Obama’s 2008 campaign. But eight years ago, many Millennials were still too young to vote, and Obama, a decade older, lacks the social media finesse that Trudeau embodies. With the burden of a global financial crisis and two failing foreign wars, not to mention the historical nature of the first African American presidency, there was always a certain restraint, in policy and in tone, to Obama’s approach. In his ‘sunny ways’ talk, Trudeau wields the legitimacy of the son of a (mostly) beloved former prime minister. He doesn’t have to worry about a ‘birther’ movement or racial backlash. More importantly, he wields the optimism of a leader who presides over a far less gridlocked political system than Obama. Under Canada’s parliamentary system, Trudeau doesn’t need to win over hardline conservative Republicans or even skittish Democrats. He just needs to convince the members of a Liberal caucus who owe their seats in the House chiefly to Trudeau’s popularity. If Obama directed his campaign to voters of all ages, Trudeau, by contrast, explicitly targeted Millennials, ditching a bipartisan consensus of over two decades in bias of fiscal restraint by promising to deploy deficit spending in the face of a sputtering economy. But that’s a perfectly reasonable response when the electorate’s most powerful demographic (18-to-34-year-olds) leans so firmly to the left, in Europe and the United States as well as Canada, a generation so young that it associates socialism with Scandinavia and not with Soviet totalitarianism, it’s perfectly reasonable. It helps explain not only Sanders’s improbable rise on the American left, but that of British Labour leader Jeremy Corbyn, Nicola Sturegon’s sunny Scottish independence movement and the success of both the leftist Podemos and the liberal Ciudadanos in Spain. None of Trudeau’s Millennial alchemy will necessarily matter if Canada’s commodities-based economy sinks deeper into recession, or if a terrorist attack spooks a chiefly pro-immigration culture to turn inward. But it’s more likely than not that the next Canadian opposition leader will have to wield the same can-do optimism and savvy social media skills.